Soo Jung (Gong Seung Yeon) is a conceited pop star who believes that status and money can get you anywhere. 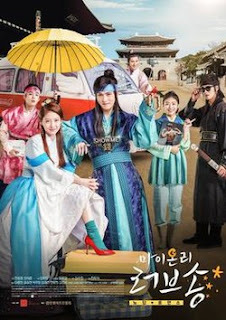 She accidentally falls into a time-slip portal and travels to the past, specifically to 6th-century Goguryeo, one of the Three Kingdoms of Korea, while it is under the reign of King Pyeongwon. There she meets On Dal (Lee Jong Hyun), a man who loves money and will do anything to earn it. However, he has a soft spot for the weak and helpless, and gives to them with a generous heart. A little gem Netflix decided to release back in June. I watched it a few days after it was released (yes, I’m so behind with this review), and literally I watched it in one night. It just grabbed me and didn’t let go, and for so many reasons it’s still vivid in my memory, like it was yesterday. I love web dramas, that are invested in. Because there are some of them that are just pure failure, but this one had a quality as if it was a full broadcast network drama. Why I liked it? The sassy actress/princess, I can’t emphasize how much I loved watching her. Some actresses fail in being feisty and lively because there are just so many characters like that, but Gong Seung Yun did a splendid job by making the character unique. Lee Jong Hyun was also good, he has definitely put his idol image aside and turned into a real actor. I liked the story, it wasn’t a new concept, but overall it’s enjoyable, however one thing that bugged me is that I just couldn't figure out the connection between the title and the storyline. Maybe if some of you understood, please let me know.